Gajapati King Dibyasingha Deb said the dieties - Lord Jagannath, Balaram and Subhadra are taken out of the temple every year during the Rath Yatra to bless devotees of different religions and lakhs of people also get to see them during the 'Snan Ustav' (bathing festival). Shankaracharya Nischalananda Saraswati and Gajapati king Dibyasingha Dev, who is considered the first servitor of Lord Jagannath, have expressed opposition to allowing entry of non-Hindus into the Puri temple. Currently, only Hindus are allowed to enter the 12th-century shrine while the issue relating to allowing entry of non-Hindus is being debated in Odisha after the Supreme Court direction on Thursday which said the Shri Jagannath temple management should consider allowing all visitors, irrespective of their faith to offer prayers to the deities. 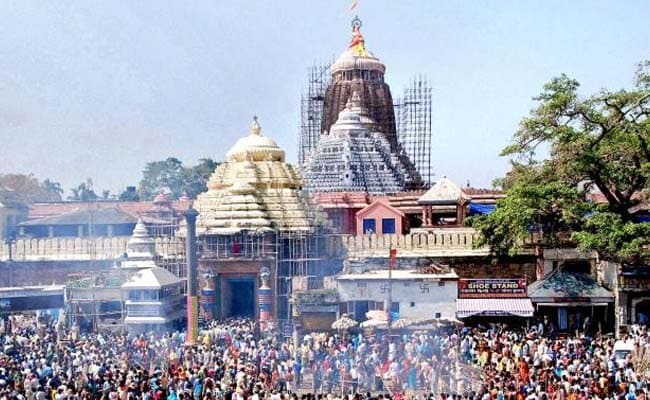 The Supreme Court's proposal is like an interim order, the Gajapati king said adding the temple management committee will deliberate on the issue after the Rath Yatra and the Shri Jagannath Temple Administration will take steps accordingly. He said when there is a question relating to religion, particularly the Sanatan Dharma and issues relating to Sri Mandir, Govardhan Peeth Shankaracharya's decision is considered to be final and even the court will accept it. Asked about the proposal of allowing non-Hindus into the shrine, Dibyasingha Deb said: "For the sake of argument let me say that if the Shankaracharya says that there is no problem in allowing entry of people of all faith into the temple, then also the government has to consider several times keeping in mind the security of the shrine." "Can the government provide total security to temple when the entire globe is facing the threat of terrorism?" he asked and wondered about the necessity to bring such a change in tradition. "The impact and consequences (of allowing non-Hindus) should also be considered seriously. One has to be very careful before taking any decision in this regard," he said. He also opposed the top court's proposal of abolishing the hereditary servitor tradition in the Shree Jagannath temple. "The state government will be urged to maintain its existing stand failing which we will file a review petition in a higher bench of the Supreme Court," said Badrinath Patnaik. On the entry of non-Hindus into the Jagannath temple, Mr Jena said this is a "proposal" given by the top court. The state government will take its decision after a unanimous conclusion is arrived at on the issue. "We will examine the content of the order after getting a copy of it. The state government will take a decision after the apex court gives the final verdict," he said. Stating that the state government is keen on reforms in the Jagannath temple, Mr Jena said that if necessary, the government will amend the Jagannath Temple Act, 1954. Senior BJP leader Bijay Mohapatra told a press conference in Bhubaneswar that stopping the servitors' hereditary practice is difficult and if done, would create chaos. Stating that the hereditary service of the servitors is clearly mentioned in section 15 clause 1 of Shri Jagannath Temple Act, 1952, he wondered why the advocate general, who was representing the state government at the time of the submission of the report by the Puri district judge, did not oppose the recommendation of the top court on the matter. Mr Mohapatra said there should be no comparison of Shree Jagannath temple with other temples. The Puri temple is a unique shrine because the servitors perform at least 120 rituals of the dieties.